This is a Marvel UK House Ad, from January 1980, teasing the 100th issue of STAR WARS WEEKLY. What was coming? A wraparound photo-cover, a seventeen-page (!) 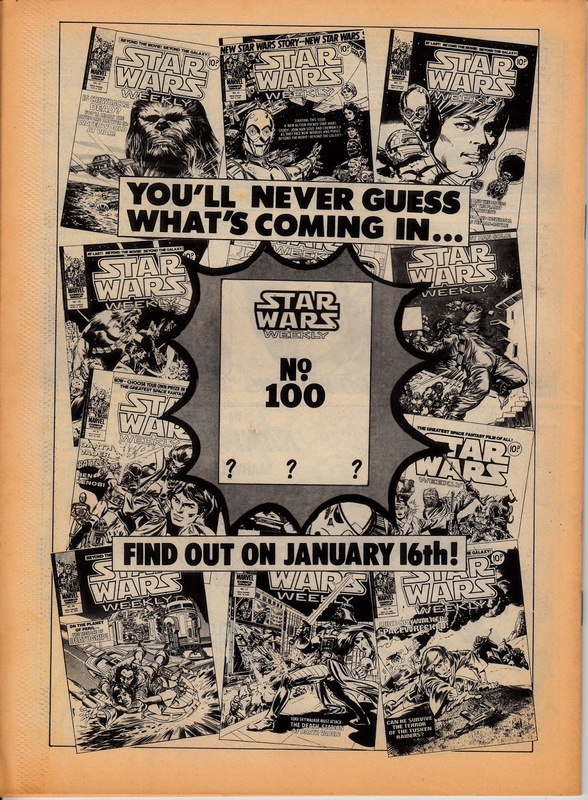 SW adventure (a reprint of THE LONG HUNT from the first US annual), a competition and a photo-feature from the upcoming THE EMPIRE STRIKES BACK. Not bad at all for 12p! And in all those 100 issues nobody ( including George Lucas ) knew that Vader, Luke and Leia were the same family! GL pretends he had the whole story planned from the start but Star Wars has glaring inconsistencies as George was making it up as he went along. I'm no SW expert but in the '77 film DARTH is Vader's name not his title- his title is LORD Vader yet when the prequels came out Darth had become a title- Darth Maul etc. And surely The Force would have given Vader some inkling that Luke was his son but obviously George hadn't thought of that in 1977 ! Oh and of course there was Luke and Leia kissing ( yes George we haven't forgotten despite the Special Edition's attempt to digitally remove it ). Why did he have to make Luke and Leia siblings anyway ? Vader as Luke's father was a neat twist but Leia as his sister stretched credulity to the limit I thought. What next ? R2D2 as his long lost cousin ?